Gold Souk Grande is one of the best shopping mall in Kerala which has high quality facilities and services. This mall includes with more stuff in reliable price. Scroll down to know about Facilities and Contact Address of Gold Souk Grande. Gold Souk Grande mall is one of the biggest mall in Cochin, Kerala. This mall is being functional from March, 2011. This mall is constructed in 57,600 square meters of about 6 floors. The architect of this mall is Atkins; certainly the developer is Aerens Gold Souk Group. A new concept of wedding shoppers has enrolled their part in this mall for the first time along with catering shoppers. This is running successfully on aid with apex customer satisfaction. Shopping in Gold Souk Grande mall gives pleasure and comfy environment. Yes, every individual can admire themselves in a grand shopping. The visitor can see their favorite brands in a reliable price. Also, this mall is stuffed with complete branded items in the way to switch everyone as more comfy to pick the best which meets their needs. Even though there are many malls in Kerala, this comes in the top list under the sign of biggest and comfortable. One of the notable points in this mall is; it has introduced top restaurants and famous shops in Kerala for the first time. Yes, for the visitor comfy KFC outlet being operated for the first time also, few of the other notable shops like Food Bazaar, Big Bazaar Fashion; grocery retail chain has opened in this mall for the first time. Plenty of brands can be purchased from this mall. Certainly, few of the famous brands are listed below: Luxury Brands like Mont Blanc, Gili, Armani and more. These brands includes with numerous models, will switch the user in an apex formal. Gold Souk Grande mall jewelry shop has Sky Jewelry shop stuffed with many collections, which will suits all age group. Zodiac Temple assists the buyers to rid of their sign problems. Visitor can get good and reliable peals from this shop. Meher Silver Ware, in this shop everyone can find super most design with newly arrived models, will attract all kind of girls for sure at the first sight. Visitor can find some needful things for their kids in Baby Care, Pepe Jeans, Tejasvi, Levi's and many more. Subsequently, everyone can find the shops for eye care to solve their issues regarding their eyesight, in the way while shopping. Some of the shops includes with Vision Express, Smart Optical. Everyone can facilitate an instant response for their complete problems over here in reliable cost. Apart from these shops home decorative shops are availed in this shop with experienced staffs. They will assist the best one which suits the buyer's home for sure. More than 200 stores and services are facilitated in this mall. As equal to the branded items, entertainment and fun at Gold Souk Grande mall equals the best. Variety and new trends of games are availed inside of this mall, will suits the complete age groups without any type of negotiation. Bowling alley is positioned at fun zone, where anyone can access by paying a reliable amount. Same will follow for snooker pool. Also, adult game center is especially designed for adult communities in order to get rid from their periodical pressure. This adult game center is being operated by Amoeba. The kids play center is being operated by B-ActivKidz. A theater zone operated by IRIDO, which includes with 6D admiring facility, will attract everyone for sure. Also, Q Cinemas provides screen Multiplex features inside of this mall. The Dining in Gold Souk Grande mall offers with hygienic and hot stuffs. Few of the popular Dining's are 24 Cara't, Pizza Hut, and KFC Restaurant. As per the individual order food stuffs will be prepared, will give invitation for more healthy dishes. In KFC visitor can get complete stuffs in chicken, will results in best place for chicken favors. Also, every individual can get a unique ideal comfy seat with quite colorful environment, which will attracts everyone to visit for the next time. Plenty of Food courts occupy the most part of mall. Among those few of those are listed below. Baskin-Robbins: An ideal corner to get varieties of Ice Cream and tasty shakes in complete flavors. Skei ice creams: In this food court, everyone can buy Ice creams and fresh juices in reliable cost even with few discounts also. Amul: This is one of the famous corners to experience a wonderful taste. Cane Sparkle: It is an ideal spot for the one, who looks for heaven like cane juices. Few of the related hot spots are Rice and Spice, Mojo, Ice Berg, Arabian Delite and more. The customer satisfaction for Gold Souk Grande mall results in more than average percentage. The visitor comes to this mall is being increased drastically. This acts as the best example for its apex satisfaction. The location of Gold Souk Grande mall is in the busiest place. So, everyone can visit without any type of transport negation. It is positioned near to Vyttila, which is the junction of Kochi behind the rail over bridge. 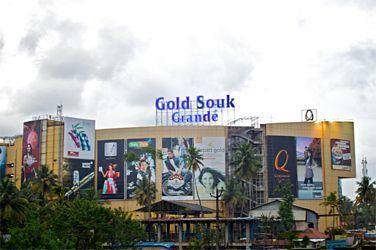 Gold Souk Grande Cochin is one of the biggest entertainer shopping mall in Vyttila, Ernakulam, Kerala. The Gold Souk Grande is a part of Gold Souk Mall group named Aerens Gold Souk International Ltd. 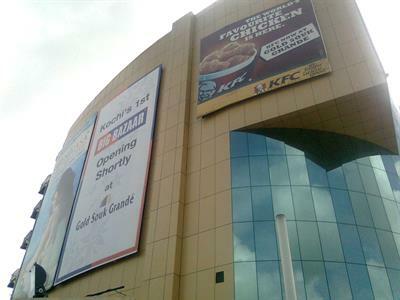 The Gold Souk Grande in Kochi is one of the biggest shopping mall in kerala and situated at vyttila, Ernakulam. Aerens Gold Souk International Ltd. The Gold Souk Grande is also famous with its Luxurious 4 Screen Multiplex movie theatre. This article is about the Gold Souk Grande Kochi. This mall, hyper market or the super market is a special mall mainly based on the wedding theme. While all items like that of all hyper markets are available here, it has retails outlets and shops for all requirements of the wedding needs. Read on for more details. The Gold Souk Grande, Kochi is a venture of Gurgaon based Arene's Gold Souk group. It is one of the largest shopping malls in Kerala with an area of about 5,00,000 sq ft. It has the presence of more than 200 brands. Read more details about the mall in the article. Here is the details description about Gold Souk Mall which is located on Vyttila, Kochi. This one of the largest shopping mall in Kerala. More than 200 national and inter national branded products are available here. Address, telephone number, Email id, and web address of the mall also added here.